SAS - Scandinavian Airlines is pleased to be appointed as the Official Airline for JAOO 2006. Participants and accompanying persons are offered special conference discounts on flights operated by SAS, SAS Braathens, Blue1, Air Baltic, Cimber Air, Estonian, Spanair, Widerøe. To obtain SAS conference fares kindly contact your nearest SAS office and quote the reference number: DK0629. 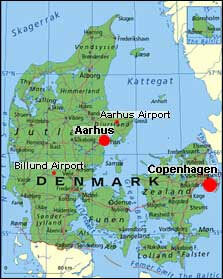 Aarhus Airport is in Tirstrup, 43 km north-east of the city. SAS offers frequent daily flights here from Copenhagen. An airport bus runs between the railway station in Aarhus and the airport, meeting all major flights. Billund Airport is located 100 km from Aarhus. Billund has a number of daily international flights. The airport bus to Aarhus goes regularly during daytime hours and takes approximately 1½ hours. Copenhagen Airport has all international and national connections. From Copenhagen either take domestic flights to Aarhus Airport (leaves every hour) or take the train directly to Aarhus City. The train takes 3½ hours.